Compost is Nature’s own living fertilizer that can be made at home or purchased ready-to-use. 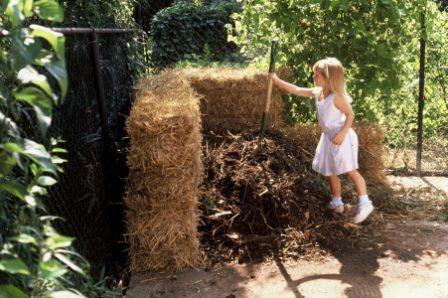 A compost pile can be started any time of the year and can be in sun or shade. Anything and everything once alive can and should go into the compost pile: leaves, hay, tree trimmings, food scraps, bark, sawdust, rice hulls, weeds, nut hulls and animal manure. Grass can but should be left on the turf by mulching them in. Mix the ingredients together in a container of wood, hay bales, hog wire, concrete blocks or a better plan is to simply pile the material on the ground. The best mixture is 80% vegetative matter and 20% animal waste, although any mix will compost. Since oxygen is a critical component, the ingredients should be a mix of coarse and fine-textured material to promote air circulation through the pile. Turn the pile once a month if possible, more often speeds up the process but releases nitrogen to the air. Another critical component is water. A compost pile should be roughly the moisture of a squeezed-out sponge to help the living microorganisms thrive and work their magic. Compost is ready to use as a soil amendment when the ingredients are no longer identifiable. The color will be dark brown, the texture soft and crumbly and it will smell like the forest floor. Rough, unfinished compost can be used as a topdressing mulch around all plantings. Compost: Approximate analysis is 1-1-1. This is the best all-around organic fertilizer. After all, it’s nature’s. Apply at a minimum of 50-100 pounds per 1,000 square feet or 800-4,500 pounds per acre. Use in all potting soil mixes and to prepare all new beds. Compost is far superior to any other form of organic matter for use in building the soil. Composting: Compost is organic matter that’s rotted and broken down into an unidentifiable form. Every living thing on earth is going to die and everything that dies, rots. Completely rotted material is compost. Compost contains many nutrients and therefore is a fertilizer. It also contains organic matter, enzymes, vitamins and living organisms. Q: Can I add the crabgrass that I pull from my lawn to the compost pile? I am concerned that the plants/seeds may grow/germinate. J.V., Denton. ANSWER: Fall is the perfect time to apply a 1/2-inch layer of compost to the entire lawn. This will do more good than anything else.